Contrary to what people say, it is possible to prepare a healthy meal that requires no form of cooking. Healthy meals don't need to be full of complex ingredient lists. You shouldn't have to slave over the stove for hours every single day. Sometimes, all it takes is a handful of good-quality fresh ingredients and creativity. In no time, you'll have prepared amazing and healthy no-cook meals. Confession: this was my first time trying chia pudding. I can't believe I've been missing out on this my entire life! Nevertheless, I spruced the popular dessert up a bit and gave it a fancy touch. You can eat this awesome, gourmet layered chia pudding for breakfast or snack! Layers make everything more fun (and pretty!). Start from the bottom with the chia pudding, place mango nice cream in the middle and finish everything up with a garnish of blackberries and muesli. Full of antioxidants, omega 3, fiber and protein, this gourmet layered chia pudding will keep you full and energized until your next meal. I was careful to make it 100% suitable for our vegan friends, but I also didn't add any extra sugar. It would have been unnecessary: the mangos make this healthy treat sweet enough! Mix together and place in fridge for at least an hour or overnight. Blend together on food processor or blender until it reaches a creamy consistency. Top the chia mixture with the nice cream to create the layered chia pudding, then top everything blackberries (or any fruit you like!) and handful of muesli, nuts or seeds of your choice. Enjoy! 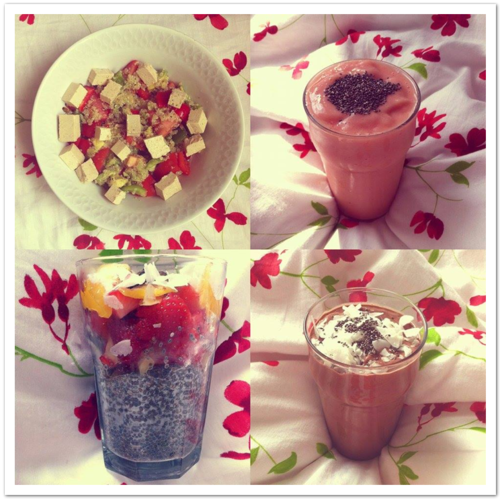 This recipe for gourmet layered chia pudding was created by PumpUp member mariajumps. Keep her pumped on the PumpUp app here! Ah, romance. Just what everyone needs…right? February is undeniably a month of love: a month when we’re encouraged to express it to others by giving gifts such as candy and flowers. If you’re loath to the idea of February in general (it’s cold, it’s slushy, it’s wet, it’s not quite spring yet, and maybe you feel a bit lonely), I feel you. But this month has plenty other good qualities that are worth highlighting. Love should also flow inwards, not just outwards. The purpose of life is to live, so start living, and start falling in love with you. You are the only person you know you can receive love from, whenever you need it. You are the only person who can give yourself permission to see the beauty of the world. Stop worrying about other people’s opinions. All what really matters is how you feel. Give yourself a chance to learn more about yourself and love yourself no matter what. You are the only person who decides how to nourish your body. The best part about choosing wholesome food is that you know that you’re eating something good for your health, and that by default means that you’re doing something great for yourself. 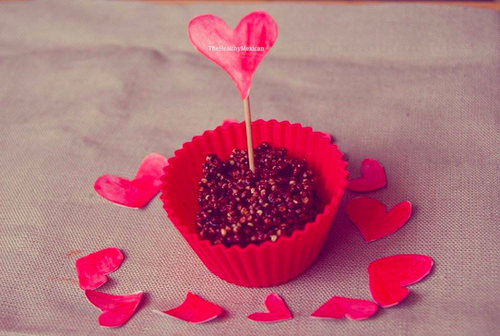 So having all that said… Here are some recipe ideas so you can try to find Self-Love through Food! Don’t forget to give you the opportunity to fall in love with your soul and your body! 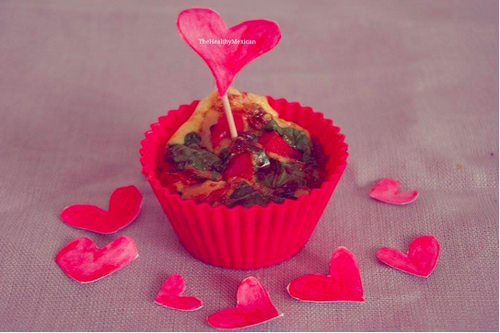 Preheat oven to 350 degrees F, place cupcake liners into a 12 muffin tin and spray generously with cooking spray. In a large mixing bowl, whisk eggs and egg whites for 30 seconds. Add flax/chia seeds, feta cheese, onion (garlic) powder, salt, pepper and whisk to combine. Add quinoa, spinach, bell pepper and mix. Fill each muffin with egg mixture 3/4 full. Bake for 20 minutes, remove from the oven and let cool for about 10 minutes. Using a rubber spatula, loosen the egg muffins from the muffin tin and slide onto a platter. Serve hot and enjoy! Mix all of the ingredients (except the puffed quinoa) in a big bowl until well-combined. Mix in the puffed quinoa. Spoon into small muffin lines. Refrigerate until set. Lightly oil a pie plate with coconut oil. Prepare the crust: Place all the crust ingredients in a food processor and pulse briefly until crumbly and the mixture will hold together when pressed with your fingers. Transfer the mixture to the prepared pie plate, pressing it evenly into the pan. Prepare the filling: Place all the filling ingredients, except the lemon zest (and starting with 3 tablespoons of the agave nectar), in a high-powered blender .Puree for a minute or so at medium-high speed until completely smooth and no texture of the cashews remains. Taste, and add the remaining tablespoon of agave, if needed, to sweeten, and puree again. 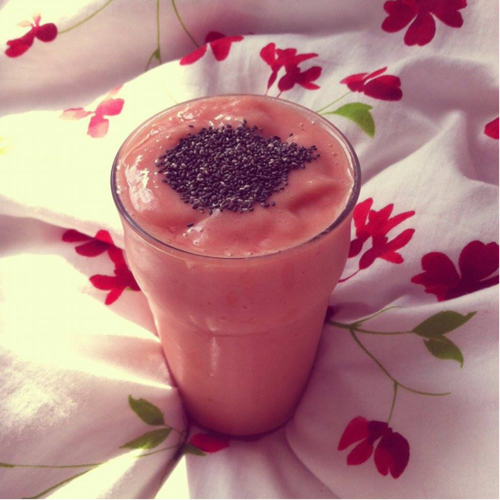 Mix together chia seeds and milk the night before, or one-two hours before you eat it. 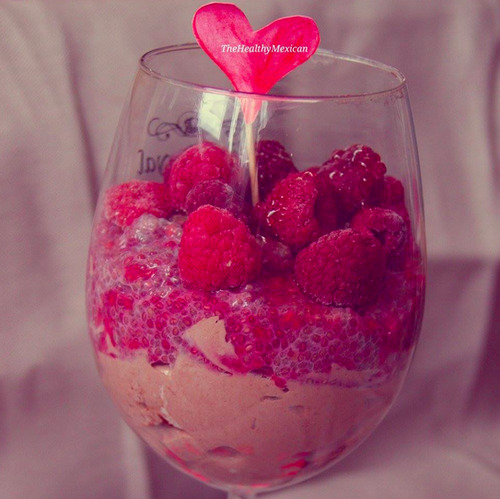 Mix the quark and berries with the chia pudding when the mixture has gotten a jelly like consistency. Done! Mix together casein powder with an optional amount of milk into a loose paste. Place batter in a glass and let it stand in the refrigerator until it has gotten a pudding consistency. It is best if it can be refrigerated over the night. The next morning put the chia mix on top of the casein pudding. Enjoy! In search of something more true to me, I started thinking ‘out of the box.’ Instead, I like to look at this time of the year as the end of a growth cycle and the beginning of the next wave of new experiences and opportunities. Its time to let go, step out of the safety our comfort zone and allow for exciting (and scary) new things to come our way. With that said, I want to share some ancient secrets with you and challenge you to try something new! Are you ready? Most of us already know that a big part of healthy living is making sure we are giving our bodies the best fuel we possibly can! Incorporating high quality ingredients into your meals will take you a long way to feeling good, but why not take it a step further and feel THE BEST EVER! Let me introduce you to your new best friends… Superfoods are a special food group found in nature that are ESPECIALLY beneficial for the body. By definition they are calorie sparse and nutrient dense meaning they pack a lot of punch for their weight as far as goodness goes. They are superior sources of antioxidants and essential nutrients - nutrients we need but cannot make ourselves. While every superfood has it’s own strengths, generally they protect your body from disease, help your body manage stress, support healthy bones and tissues and even improve your memory! Nearly every culture in the world has some sort of superfood, whether it’s the Goji Berries from China, Maca Root from Peru or Chaga mushroom from the forests of Siberia, these nutritional powerhouses have been used as medicine and touted for their healing properties for centuries! Want to learn more? Good news! 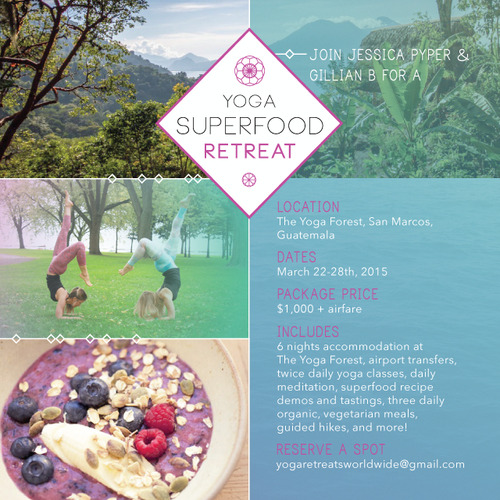 At the end of March, 2015, I am hosting a Yoga + Superfood Retreat in beautiful San Marcos, Guatemala!! There we will be practicing yoga, hiking in the jungle, playing in the sun, swimming in the salt water and learning all about superfoods and how to incorporate them into your daily routine. Never considered a retreat? Well, now is the time. Remember: try something new! Goji Berries: are the most nutritionally dense fruit on Earth! Native to the Himalayan Mountains of Tibet and Mongolia, these little babies are a complete source of protein, are also loaded with vitamin C, contain more carotenoids than any other food, have twenty-one trace minerals, AND are high in fiber. POW! Maca: Well known for it ability to boost energy, endurance and stamina, the Peruvian root, Maca has been used for centuries as a tonic for sexual function and hormone balancing. It is rich in vitamin B vitamins, C, and E. It provides plenty of calcium, zinc, iron, magnesium, phosphorous and amino acids. 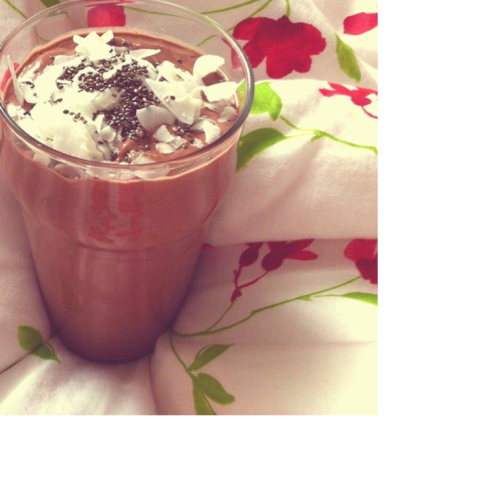 It creamy taste goes nicely in energy balls, coconut MACAroons, chocolate elixirs and smoothies! Hemp Seeds: They are the most nutritious seed in the world! Hemp Seeds are also a complete protein and just the right balance of essential fatty acids. Raw hemp provides a broad spectrum of health benefits and are perfect to throw on top of salads, soups, in energy balls and smoothties! Chia Seeds: Originally cultivated and used by the Mexica, chia seeds are a complete source of easily digestible, plant-based protein. As well as a great source of essential fatty acids, a rich source of calcium, 3 X more iron than spinach, 15 X more magnesium than broccoli and 64 % more potassium than banana! The insoluble, gelatinous fibre aids digestion and cleanses the digestive tract. 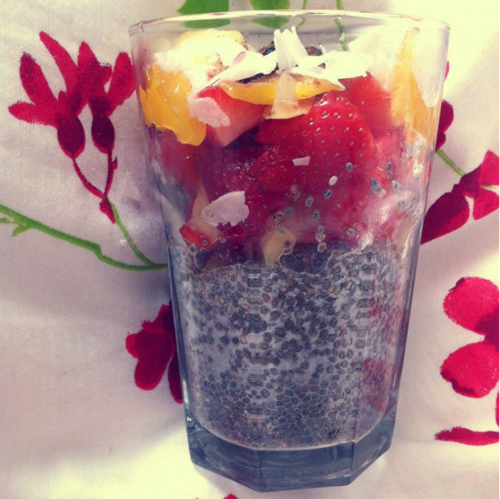 I use chia seeds everyday in my superfood elixirs or in my go-to breakfast of chia pudding! This retreat will be the perfect combination of relaxation, education and healing… I hope that you can join us! For more information click here and feel free to email me through the contact form on my site with any questions. I can’t wait to share all my tips, tricks and creative recipes with you! 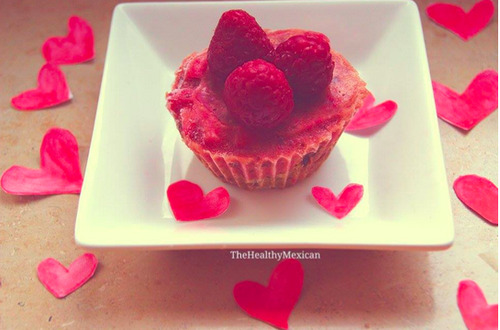 This post is part of a series of monthly posts by Valentina M. Read her story below and follow her on Instagram @thehealthymexican9 and on PumpUp @thehealthymexican. We should always live a healthier lifestyle because nowadays there are so many factors contributing to health degeneration. This includes pollution, chemicals in our food or beverages , etc. The problem is that most people (myself included) start to take action only after they fall sick, or are in the process of losing their health. I urge you, before you face a health problem or if you are facing it right now, start taking care of you and love yourself. I faced the need for surgery on my left knee and afterwards the doctors realized it was a bad diagnosis and the real problem was a herniated disc. After surgery I didn’t start a healthier life and began to have many other health problems so when I went to the doctor he told me I needed to start living healthier or everything will be worse. It took me many starts and frustrations before I learned how to live a healthier lifestyle. Today, I am much healthier and fitter. I eat healthily most of the time (with regular indulgences) and I’m able to stick to a meal plan if I want, and avoid junk food most of the time. I know how hard can that be, but it is not impossible. My advice for you is be creative and explore new foods, explore fruits, seeds, vegetables,nuts. There are foods that many people don’t eat on a regular basis or have never tried some of these. Explore the power you will feel by eating the right things. Start today! Get healthy with me! There are so many healthy and easy recipes you can start doing right now! Combine all ingredients in a blender and blend until smooth. Add ice according to desired thickness. Decorate the top with some unsweetened coconut flakes, chia seeds or fresh berries or nuts if you wish. 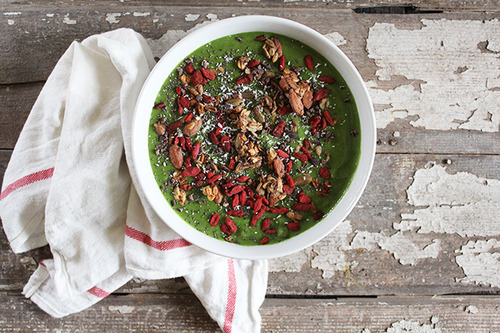 Blend all ingredients for 20-30 seconds and enjoy! Decorate the top with some unsweetened coconut flakes, chia seeds or fresh berries or nuts if you wish. Combine all ingredients in a large container Mix and close the container. Refrigerate overnight or at least 5-6 hours. Decorate with more fruits and coconut flakes. 1.Bring water and 1/2 teaspoon salt to a boil in a medium saucepan. Add quinoa and return to a boil. Reduce to a simmer, cover and cook until the water has been absorbed, 15 to 20 minutes. Spread the quinoa on a baking sheet to cool for 10 minutes. 2.Meanwhile, whisk lemon juice, oil, garlic, the remaining 1/4 teaspoon salt and pepper in a large bowl. 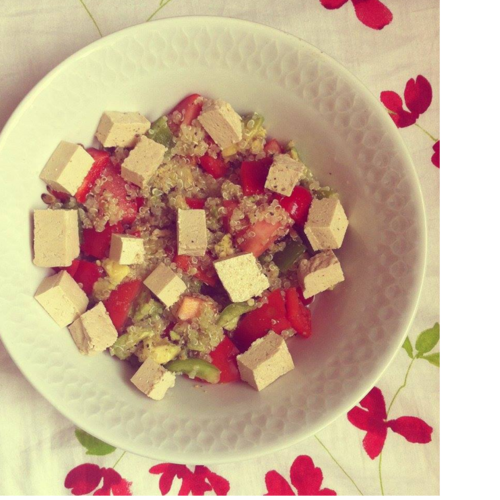 Add the cooled quinoa, tofu, bell peppers, tomatoes, cucumber, avocado, parsley and mint; toss well to combine.